The New Forest Spring Sportive is one of the New Forests most popular events and has become a welcome ‘start of the season’ test for may cyclists, this year held on the 13th and 14th April. Starting and finishing just outside the Hampshire town of Verwood, the riders took in the rolling scenery with a number of hills to challenge their legs. 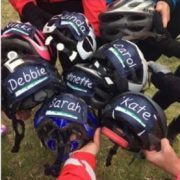 Eight of the touring ladies from Cycle Seahaven, including Sarah Webb, Debbie McFly, Carol Bryant, Kate Parkinson, Annette Blackman, Heather Cheek and Linda Pilkington-Peachey took on the challenge. 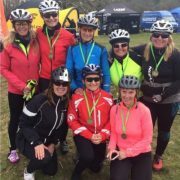 ‘The 7 Sisters’ team completed the 66 mile New Forest Sportive on Sunday (the eagle-eyed among you may notice there’s 8 of us but we liked the team name so much we kept it). We all met through Cycle Seahaven and have had great support from our fellow riders in the tourers group. We didn’t specify this had to be a ladies only weekend but that’s the way it worked out, so naturally there was a 2 night stay in a log cabin with sauna and fizz involved! The 7 Sisters. All eight of them! 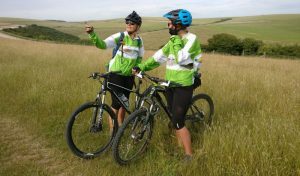 Sustrans is excited to announce that the UK Government have pledged an incredible £21 million to improve significant on and off-road stretches of the National Cycle Network. Money will be put towards many of the England activation projects, working with partners across England, and especially Highways England (who they already work with on the Network) and around the HS2 corridor. Their vision for the Network is a good one, and a timely one. The Network is an asset for all our nations and regions. They have set their stall out with honesty and rigour, and provided a clear plan of what they would like to do – not by themselves, but by working with others. So it’s great to see this approach lead to investment. The Network has attracted considerable investment in Scotland, but it’s been a struggle to get traction in England for some years. They are now in a position to fund more activation projects and explore new opportunities. They’ll also be looking to attract investment for improvements in Wales, London and Northern Ireland. You can read more about this investment and what it means for Sustrans and the National Cycle Network on their website. Sustrans Big Pedal is the UK’s largest inter-school cycling, walking and scooting challenge inspiring pupils, staff and parents to choose human power for their journey to school. 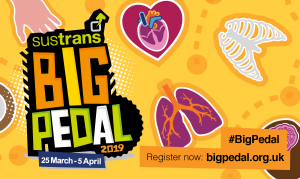 Sustrans Big Pedal will run for 10 days from 25 March to 5 April 2019 and is open to all primary and secondary schools in the UK, including SEN schools. The aim of the event it to encourage a reduction of car use and to make the area around the school safer and cleaner, improving the quality of the life for everyone. As such we will be holding a School Street event as part of a nationwide effort to raise awareness of air pollution and encourage people to think differently about how they travel to school. Denton Community Primary School will be holding our first ever School Street event in Acacia Road and Denton Road. Road closures are planned to take place from 8:00am to 10:00am and then again in the afternoon 2.00pm to 4:30pm. Cycle Seahaven are contributing by running our ever popular Dr Bike services at the event. Contact the Dr Bike team here if you want to help out.